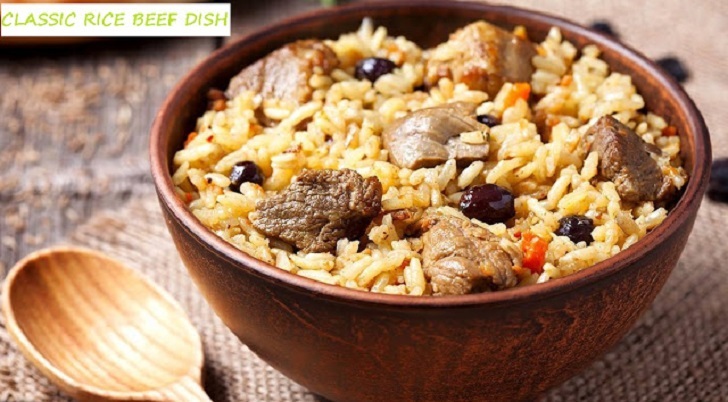 This beefsteak and rice dish will make you fall in love all over again! A good hearty meal went down well with the family of five! Wash the rice and leave it to soak in a bowl of water for about 30 minutes. Once done, drain the water and set aside. Boil the meat with the stock cube and half the garlic-ginger paste. Cook until the meat becomes tender, so for about 45 minutes to an hour. Set aside once done and save any of the liquid for later use. Heat the cooking oil in a pan over medium-high heat. Saute the onions until well browned but not burnt. Add the remaining garlic, ginger, and tomato paste, stir for 1 minute. Add the powdered spices and cook until fragrant, about 15 seconds. Next, add the meat and stir to coat with the onion mixture. Cook for 15 minutes and then add the rice and the raisins. Season with salt, stir and add 2 cups of water including the beef stock from step 2. Cover and cook on high heat for 2 minutes then reduce the heat to low and continue cooking for another 10 - 12 minutes while covered. Leave the rice to rest for 10 minutes and then fluff it up using a wooden fork before serving.